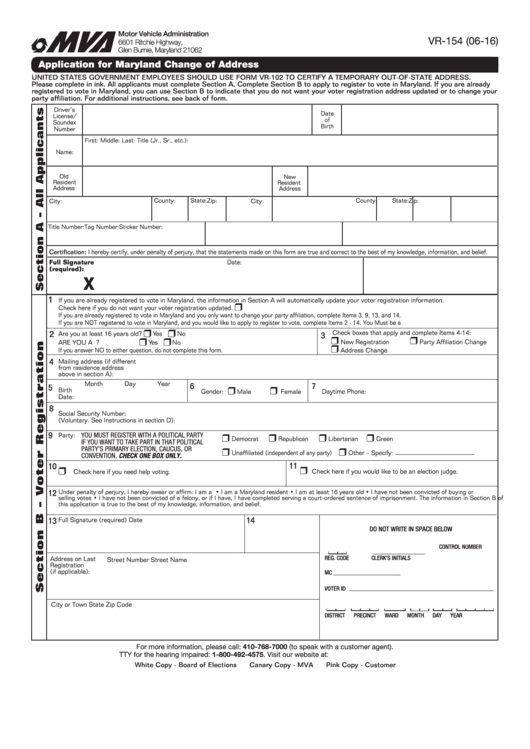 UNITED STATES GOVERNMENT EMPLOYEES SHOULD USE FORM VR-102 TO CERTIFY A TEMPORARY OUT-OF-STATE ADDRESS. party affiliation. For additional instructions, see back of form. Certification: I hereby certify, under penalty of perjury, that the statements made on this form are true and correct to the best of my knowledge, information, and belief. If you are already registered to vote in Maryland, the information in Section A will automatically update your voter registration information. Check here if you do not want your voter registration updated. If you are already registered to vote in Maryland and you only want to change your party affiliation, complete Items 3, 9, 13, and 14. If you are NOT registered to vote in Maryland, and you would like to apply to register to vote, complete Items 2 - 14. You Must be a U.S. Citizen. If you answer NO to either question, do not complete this form. CONVENTION. CHECK ONE BOX ONLY. Check here if you need help voting. Check here if you would like to be an election judge. this application is true to the best of my knowledge, information, and belief. For more information, please call: 410-768-7000 (to speak with a customer agent).